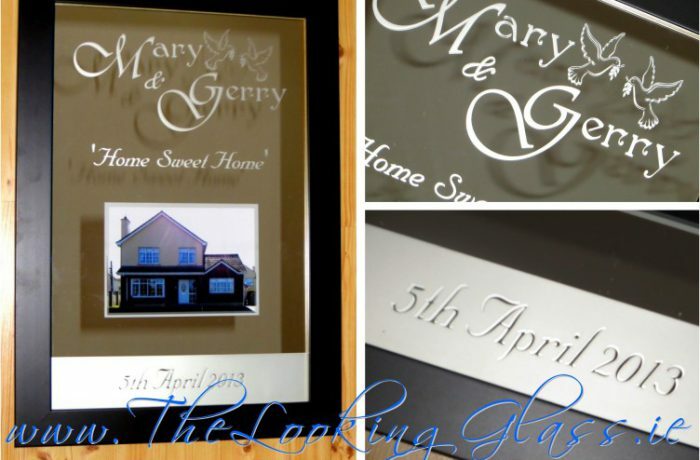 Roy emailed us to enquire about the a gift for his friends Mary & Gerry’s new home. Once we received the details and a photo of the new home, the above design came together very quickly and this engraved mirror housewarming gift now adorns the hallway of the happy couple’s new house. With the traditional happy message HOME SWEET HOME greeting everyone to cross the threshold, we think that this present is both unique and very thoughtful on Roy’s part. The two lovebirds fluttering above the names are particularly cute, we think, and the date they moved in will never be forgotten! The mirror came out great. We gave it to Mary & Gerry at the weekend and they were delighted with it. I’m just after liking your Facebook page. Next time I hear of anyone looking for a good present, I’ll point them in your direction and I’m sure I’ll be back to you again in the future.